My work is focused mostly on two intersecting realms: dissolved and particulate organic matter and microorganisms. I like (almost) everything of them from biology to chemistry. Dissolved organic matter (DOM) in aquatic ecosystems includes a broad suite of optically active (chromophoric) compounds that play a significant role in the cycling of carbon and other elements as it mediates photochemical reactions and light attenuation in water column. 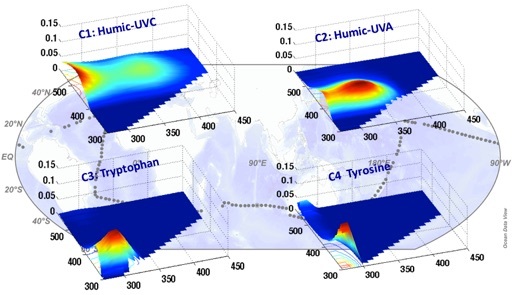 We have been studying photochemical processes as photobleaching and photohumification in diverse ecosystems ranged from boreal to alpine lakes and in marine ecosystems as well. We have focused on the bacterial generation of chromophoric organic carbon as an important direct source of optically labile compounds with further consequences for carbon processing by bacteria. During the Malaspina Circumnavigation 2010 we performed a global inventory of fluorescent and chromophoric dissolved organic matter and determined their long-term drivers. This last research was mostly the dissertation of Teresa S. Catalá (please see in publication list). Interface between dissolved and particulate organic matter: selfassembly, coalescence, and sedimentation. Exopolymer particles as major POM components. The operative discrimination between dissolved (DOM) and particulate organic matter (POM) is a major issue with obvious consequences for carbon cycle. POM settles down by gravity exporting C from surface to deep waters whereas DOM is retained into the water column. Most studies analysing this interface have been focused on biological issues as microbial DOM-POM conversion. However, the abiotic transformation of DOM into POM by selfassembly, coalescence and/or changes in phase transitions associated as pH is poorly known and represents an alternative pathway to microbial loop. We are studying the chemical and environmental factors that regulate abiotic DOM-POM interface using the polymer gel theory as a theoretical framework. 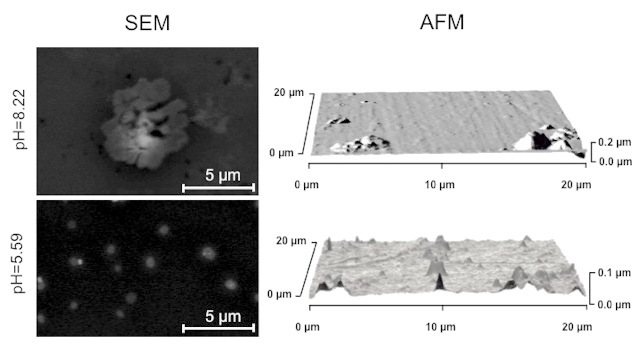 We have paid a particular emphasis on exopolymer particles derived from phytoplankton and bacteria in the dissertations of E. Ortega-Retuerta and Ignacio P. Mazuecos (please see in the publication list). 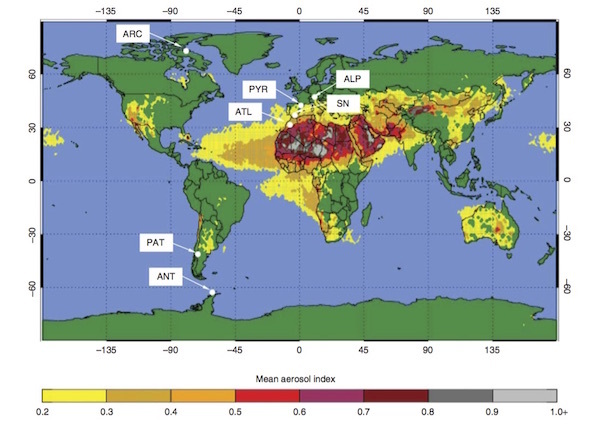 Desertification and changes in the land use are promoting a considerable increase of dust content in the atmosphere with implications for global change. This increase in soil-derived aerosols is affecting the radiative balance of the atmosphere and particles, inorganic and organic nutrients, pollutants, and microorganisms are also mobilized. We are studying the mineral and organic compounds of aerosols with a special emphasis on Saharan dust outbreaks. 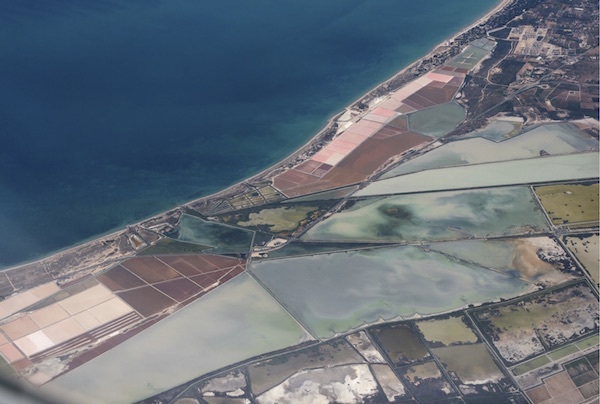 We are mostly focused on water soluble organic matter derived from aerosols using diverse techniques ranging from stable isotopes to spectroscopy (fluorescence and absorption) and its effects on remote lakes. More recently, we are assessing the role of aerosols as a vehicle of long-range transport of microorganisms and their colonizer ability. We are determining their loading, viability, and potential success of airborne bacteria in remote lakes with high ecological value. (Figure from Mladenov et al. 2011, please see in the publication list). Most studies on the factors shaping bacterial community structure have been focused on the role of substrate availability, productivity, environmental stability and competitive, predation or parasitic interactions. Only recently, historical factors of geographical location are starting to be considered. Empirical evidences suggest a considerable role of the spatial structure on microbial community composition. This approach has an understandable influence from macroecology principles and is opening new insights into bacterial community structure studies.